The aim of the IB programme is to develop internationally minded people who, recognizing their common humanity and shared guardianship of the planet, help to create a better and more peaceful world. 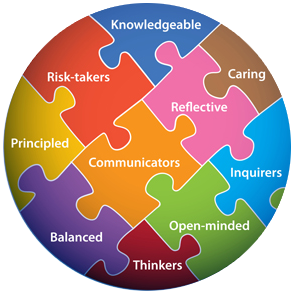 IB learners strive to be - Inquirers, Knowledgeable, Thinkers, Communicators, Principled, Open-Minded, Caring, Risk-Takers, Balanced and Reflective. They develop their natural curiosity. They acquire the skills necessary to conduct research and show independence in learning. They actively enjoy learning and this love of learning will be sustained throughout their lives. They exercise their initiative in applying thinking skills critically and creatively to recognize and approach complex problems, and make reasoned, ethical decisions. They understand the importance of intellectual, physical and emotional balance and strive constantly to achieve it. They give thought to their own learning and experience. They are able to assess and understand their strengths and limitations in order to support their learning and personal development.